FRAMINGHAM – Today, May 14, as part of Municipal Month, the Baker-Polito Administration announced two milestones for communities in Massachusetts under the Administration’s Housing Choice Initiative, a comprehensive new effort to create 135,000 new housing units by 2025. The initiative, announced in December 2017, includes a new set of incentives and rewards for municipalities committed to sustainable housing growth in their communities. Lt. Governor Karyn Polito announced the designation of 67 communities as Housing Choice Communities, and one of the 67 is the City of Framingham. The towns of Ashland and Natick also made the list. And in partnership with MassHousing, the Commonwealth awarded Planning for Housing Production technical assistance grants to 15 municipalities. Both announcements will support communities in their efforts to substantially increase housing production across the Commonwealth. 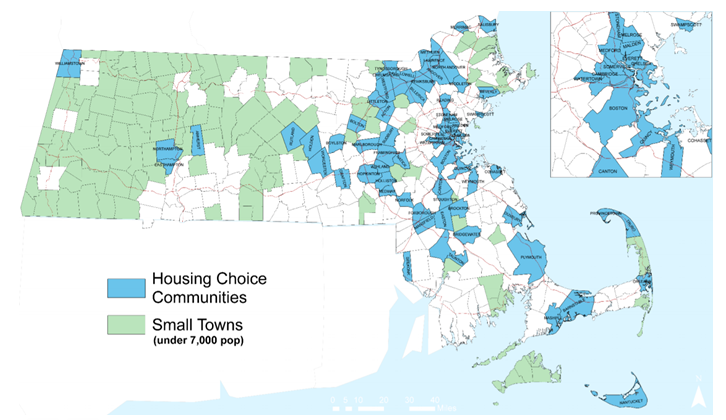 The Housing Choice Initiative is a multi-pronged effort, which includes today’s Housing Choice Designation, new technical assistance through MassHousing, and proposes legislative changes, through An Act to Promote Housing Choices, to deliver smart, effective zoning at the local level. Communities who received the Housing Choice Designation have produced a total of nearly 60,000 new housing units over the last five years. These 67 communities each have proven track records of pursuing substantial housing production, and are committed to continuing that trend. The Housing Choice Designation is designed to be simple, flexible and achievable for municipalities, and in the program’s first year, 67 communities will be able to take advantage of new financial resources, including exclusive access to new Housing Choice Capital Grants, and preferential treatment for many state grant and capital funding programs, including MassWorks, Complete Streets, MassDOT capital projects, and PARC and LAND grants. In addition to announcing the first Housing Choice Communities, MassHousing announced Planning for Housing Production awards for 15 communities to help municipalities achieve their affordable housing goals and deliver new mixed-income housing in a manner that is consistent with local priorities. These awards are part of MassHousing’s commitment to the Housing Choice Initiative, by making available $2 million in new technical assistance funding. Participating grantees have already engaged in local housing planning, but have identified obstacles that prevent the realization of their planning vision; MassHousing’s grants will provide grantees with the technical expertise to implement housing planning, and deliver new housing. By assisting municipalities in progressing toward, achieving and exceeding Chapter 40B’s ten percent affordable housing goal, MassHousing’s Planning for Housing Production Program will help reset the way cities and towns interact with Chapter 40B, and forge new partnerships between MassHousing and participating municipalities to meet the Commonwealth’s housingchallenges. The planning services MassHousing will offer communities will vary, depending on local needs, to spur housing development, but may include assistance in crafting new zoning, planning public infrastructure improvements, capacity-building in planning and community development, and public education and data transparency initiatives to increase community support. The Baker-Polito Administration is deeply committed to meeting this housing challenge, through key investments, new initiatives and program reforms. Last year, Governor Baker filed a housing bond bill seeking $1.287 billion in additional capital authorization to advance the administration’s commitment to affordable housing and we have increased funding for affordable housing by 19% and is on course to invest $1.1 billion over five years in affordable housing. The highly effective MassWorks Infrastructure Program continues to be a key catalyst for housing production, supporting the creation of more than 3,000 housing units. The Open for Business Initiative will drive the production of more than 2,200 units of housing on state land. MassHousing’s $100 million Workforce Housing Initiative has advanced the development of 2,309 housing units across a range of incomes, including 616 workforce housing units. And, through An Act Relative to Job Creation and Workforce Development, the administration reformed the Housing Development Incentive Program, which is on track to facilitate more than 900 new units in Gateway Cities.